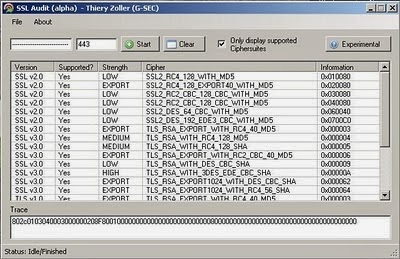 SSL Audit remotely scans web servers for SSL support, unlike other tools it is not limited to ciphers supported by SSL engines such as OpenSSL or NSS but can detect all known cipher suites. It features an innovative Fingerprinting engine that was never seen before. Included is an experimental fingerprint engine that tries to determine the SSL Engine used server side. It does so by sending normal and malformed SSL packets that can be interpreted in different ways.